The patient claims proper medication and attentiveness from the hospital staff would have prevented the devastating injury she caused herself. Ann Ruhlman hopes her painful story will help break the barriers to better care for the more than 130,000 San Diegans who struggle with serious mental illness. Ruhlman gouged out her right eye during a psychotic episode at the Sharp Grossmont Hospital Emergency Department. In a lawsuit filed last December, Ruhlman claims Sharp Grossmont and three health care providers failed to provide adequate care and are responsible for her serious and permanent injury. Ruhlman said she knew those thoughts were the symptoms of a psychotic break caused by her decades-long struggle with severe mental illness. She said she had a friend drive her to the Sharp-Grossmont emergency room in La Mesa for help. According to her lawsuit, hospital staff diagnosed her as “delusional, confused and paranoid,” and sedated and restrained her. But Ruhlman’s legal action alleges hospital staff removed the restrains an hour later. "The first thing she did was scratch her cornea,” Ruhlman’s attorney, Norm Finkelstein told NBC 7 Investigates. “They knew that, they treated that, but then left her alone again." Ruhlman said her psychotic thoughts continued. "Then the voice said, ‘If you love those people, you would have done it already, because they’re suffering, they're burning.’ I even got instruction, like 'Turn your fingers to the left, turn your fingers to the right, to do it right.'" Ruhlman said she followed those instructions. Freed from the restraints, she gouged out her right eye at about 11:15 p.m., some eight hours after she arrived at the hospital. Finkelstein said Ruhlman’s medical record shows that “the emergency room doctor even commented that she needed to be (continually) restrained,” but was not. “That’s their job. She was there for psychiatric care, and it wasn’t given to her,” Finkelstein added. Sharp Healthcare denies those allegations, in both a denial filed with the court, and a statement to NBC 7 Investigates. A Sharp spokeswoman acknowledged the "incident is most unfortunate," but said the hospital "provides high-quality care and complies with all regulatory requirements specific to the use of physical and chemical restraints." The lawsuit also names the emergency room physician who treated Ruhlman, Dr. Estylan Arellano, and physician’s assistants Brittany Jordan and Shanon Murillo. They have not filed responses to the lawsuit, and could not be reached for comment about the allegations of malpractice in their treatment of Ruhlman. 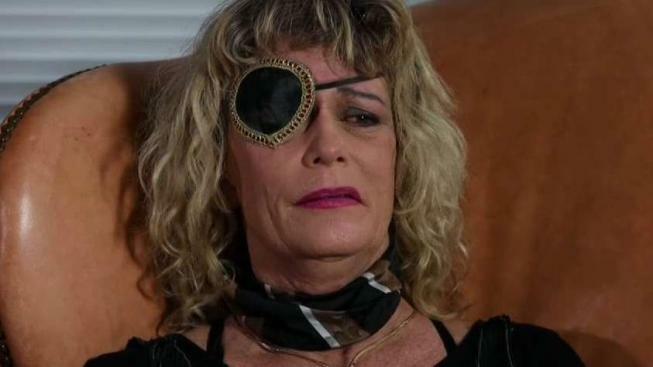 Ruhlman now has a prosthetic eye and an eye patch, but she said her life has been permanently and unalterably impaired by that self-inflicted injury. Dr. Clark Smith, a forensic psychiatrist not associated with Ruhlman’s case, said Ruhlman’s tragic outcome highlights the bigger problem of substandard care for the mentally ill in San Diego County. The National Alliance on Mental Illness (NAMI) says one in five adults in the U.S. -- or about 44 million people -- experience mental illness in a given year. Yet just 40 percent of mentally ill adults are getting treatment for their condition. There are private and public psychiatric wards in San Diego County, but Smith said the wait for specialized treatment is often unacceptably long. Documents reviewed by NBC 7 Investigates confirm the huge gap between the need for emergency psychiatric care and the resources available to treat it. Emergency department visits for schizophrenia in San Diego County jumped 61 percent in a recent five-year period, according to data from the state Office of Statewide Health Planning & Development. As of last October, the county had approximately 775 beds available for the mentally ill in crisis. Health care experts say that's less than half the minimum number of beds needed to properly care for the mentally ill.
Dr. Smith said it’s a huge challenge for advocates to find the resources needed to properly care for the mentally ill and provide important services for their families. He said the mentally ill often lack the resources and skills needed to lobby for better funding, while family members, who are sometimes embarrassed, scared and overwhelmed by their loved one’s illness, may ignore the problem or feel powerless to help. Ann Ruhlman has lived that harsh reality for decades. Now she also sees it every morning in the mirror. "If I could, if I had any power at all, I would change the way the mentally ill are treated. It makes you even more crazy the way they treat you,” she said.